As evidence of one of Marvel's most prolific ongoing partnerships, the release of a new project from Brian Michael Bendis and Alex Maleev is quickly becoming something of an event. With a landmark run on Daredevil and subsequent pairings on Spider-Woman, Mighty Avengers and Halo: Uprising already on their joint resumé, the duo have recently branched out with a fully creator-owned series, Scarlet. This series marks a noticeable departure from the relatively comfortable terrain of the duo's previous partnerships. 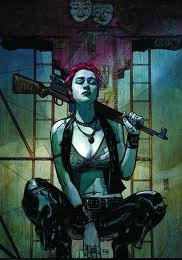 Casting aside the security blanket offered by superheroics, no matter far from the norm their take may have been, with Scarlet these two are investigating terrain that's much more in line with some of Bendis's earlier works: Goldfish, Fire and Jinx. It's filthy and grimy, street-level justice achieved by asking guilty people the questions they don't want to hear and discerning the truth from the meat of their lies. Rather than painting the enemy as a dark-souled oppressor that can be punched, thwarted or intimidated, Scarlet's outlook is much more bleak: everyone's responsible and you don't know the first thing about getting even. Bendis catches a lot of flack for his dialog, particularly in his mainstream work. Without a pressing directive at the front of his mind, he'll often opt for character-building small talk that's whimsical if not always pertinent. Admittedly, he does frequently overdo it in that regard: it's just not as exciting to watch the Avengers stand around their HQ and talk about their pet peeves as it is to join them in staring down Doctor Doom. When he's going somewhere significant with it, however, there's really nobody in the industry who can script dialog like him. A decade's worth of disregard hasn't dulled that axe one bit: diving into a seedy underworld like the one at the center of Scarlet, Bendis slips back into his old form like a comfortable sweater, rescued from the closet on the first cold day of winter. Which isn't to say this is packed with wall-to-wall ward balloons: in fact, it's actually a remarkable show of restraint. The words are thick and character-soaked when applicable, but completely absent when they aren't essential. It's an astoundingly mature work, leaping from a lengthy monologue to page after page of stark, tense silence. Bendis has struck a careful balance in that respect, and the results are magnificently successful. It's a far cry from Ultimate Spider-Man, and the change is entirely welcome. But while Bendis's storytelling is a departure from his recent work, it's really Maleev who displays the biggest change in character. Free from the restraints of a sharp deadline and a set of rules and guidelines dictating what is and isn't acceptable in a mainstream comic, Alex's artwork is an explosion of creativity, experimentation and personal exploration. He ventures from David Mack-influenced sketchbook watercolors to richly layered noir-inspired shadow paintings to full-on pop art, all while maintaining a deep, rewarding connection to the central narrative. Despite these dalliances into uncharted territory, Maleev never loses sight of himself. Each panel might be trying something different, reaching and stretching in unexpected new ways, but at its heart there's never any question who's behind the pencil. He maintains his identity without question through every transformation. If this is a sign of what's on the horizon, Maleev may be on the cusp of something gigantic. It's breathtaking. Listen, this series is not for everyone. I get that. If you don't have a soft spot for grime and grit, for revenge drenched with blood, this will not be your cup of tea. It's not for grandparents, nor for your children. It's also too bold for Marvel's main line, which makes its relationship with their creator-owned subsidiary, Icon Comics, a sensible one. But if you're looking for a smart series, spoiled characters making bad decisions in stressful environments and dealing with the repercussions when (and if) they should arise, if you're after amazing artwork, tremendous dialog and a twisting, turning plot… well, then by all means buy it. You won't be alone.